Six youths and a guide left Whapmagoostui in January to snowshoe and walk to Ottawa in support of the Idle No More movement. They called the trek "The Journey of Nishiyuu," which means "The Journey of the People" in Cree. 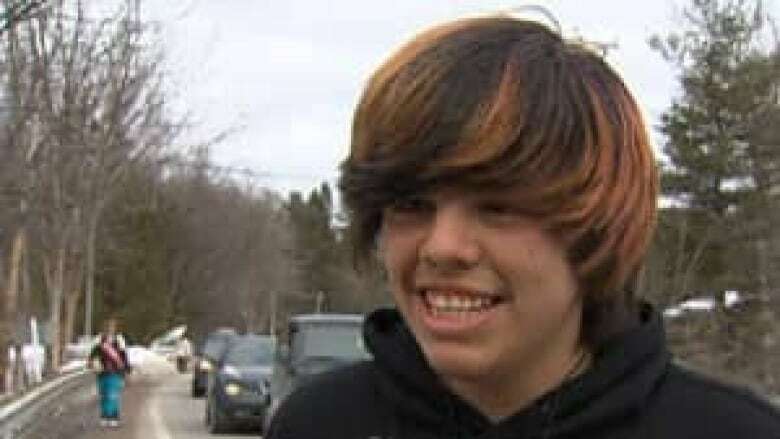 The group numbered nearly 400 in the trek's final hours, according to volunteers and Gatineau police, after other children and youth from Cree and Algonquin communities joined them along the way. 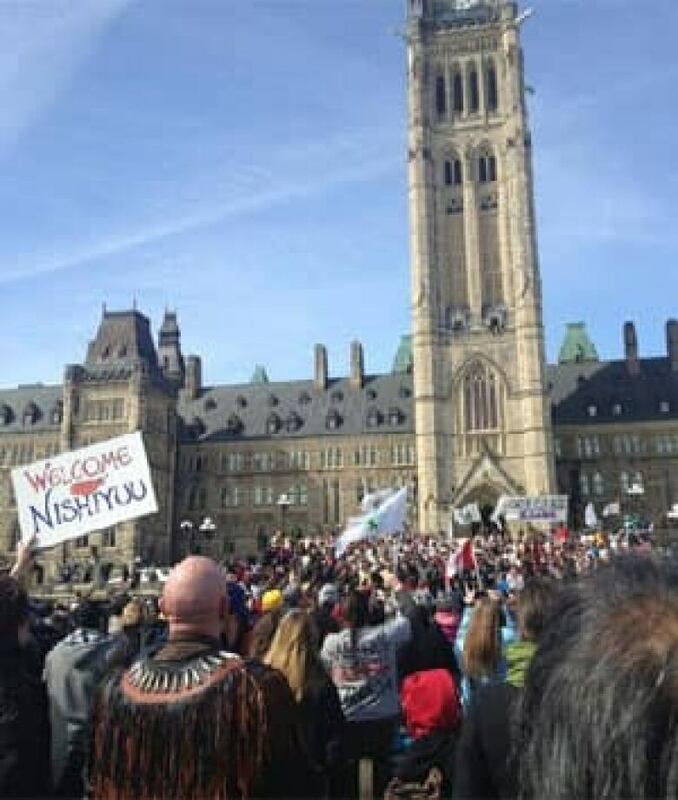 Thousands more people joined them on Monday afternoon at Parliament Hill as their journey came to an end. The group's wish to meet with the prime minister was not met, as Stephen Harper was in Toronto Monday for a special ceremony to greet two Chinese pandas en route to the Toronto Zoo. But Aboriginal Affairs Minister Bernard Valcourt did meet with a small group of the original walkers late in the day. No cameras were allowed at the meeting, but the minister was said to have accepted an invitation to visit their First Nation this summer and learn more about their concerns. "It feels really good, but at the same time I'm really sad that it's ending," he said on Sunday as the group reached Chelsea, Que., about a three-hour walk from Ottawa. "Because a lot of us shared a lot good times here, sad times, but we all stuck together." Photos of youngest walkers among the images being shared on social media. Read more. Others on the walk have told Kawapit it's helping them deal with personal struggles, Kawapit said, including depression and suicidal thoughts. Kawapit struggles with the same. "It feels really good that a lot of people are paying attention to what's going on, and that a lot of these guys that are walking with us are helping themselves on this journey. "But this journey's really shown me a lot — how much I can help people. And it's really given me a better understanding of life. I've made a lot of friends here, so there's no way I'm going to leave them." The walkers have drawn support from Aboriginal leaders and many of the First Nations communities they have met along the way. Theresa Spence, the Attawapiskat First Nation chief whose six-week hunger strike was another flashpoint in the Idle No More movement, said she has been inspired by what they did. "It shows that they're really proud of their land and telling everybody … the land is there for them and they really want to protect the land, so walking — the journey was really a commitment for them to be strong about something they're determined about," Spence said. Theoren Awashish joined the group about half the way into the journey, but had to stop for a week to seek medical aid after becoming seriously ill. He said the choice to rejoin the group and return to the walk once he was better was a simple one. "Because I miss them, because they are brothers and sisters," Awashish said. Lisa Commanda joined the group of walkers on Thursday when they reached the Kitigan Zibi Algonquin reserve in western Quebec. She said the walk has been a learning experience for everyone. "It's just been a truly amazing experience. I'll tell you, words cannot describe the feeling that I'm feeling, that the group is feeling, that the walkers are feeling," Commanda said by phone Monday morning. The first of the group began arriving at Victoria Island just after noon, where a welcome ceremony took place. The group then completed their walk to Parliament Hill. In the House of Commons, Aboriginal Affairs Minister Bernard Valcourt acknowledged the determination and commitment of the those who made the journey, and said he would meet with them to hear what they have to say. Valcourt also expressed a desire to engage youth in key issues facing communities across the country and said he would accept an invitation to visit the Whapmagoostui First Nation this summer. National Chief of the Assembly of First Nations Shawn Atleo and Spence both spoke at the demonstration. When The Journey of Nishiyuu arrived at Kitigan Zibi last week, 22 of the walkers sought medical attention at the community’s clinic for foot injuries.